Heterologous expression systems are often employed to generate sufficient quantities of isotope-labeled proteins for high-resolution NMR studies. Recently, the interaction between the prodomain region of subtilisin and an active, mutant form of the mature enzyme has been exploited to develop a cleavable affinity tag fusion system for one-step generation and purification of full-length soluble proteins obtained by inducible prokaryotic expression. 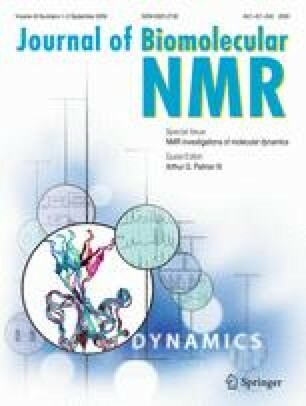 As a first step towards applying high-resolution NMR methods to study heterotrimeric G-protein α-subunit (Gα) conformation and dynamics, the utility of this subtilisin prodomain fusion system for expressing and purifying an isotope-labeled Gα chimera (∼40 kDa polypeptide) has been tested. The results show that a prodomain fused Gα chimera can be expressed to levels approaching 6–8 mg/l in minimal media and that the processed, mature protein exhibits properties similar to those of Gα isolated from natural sources. To assay for the functional integrity of the purified Gα chimera at NMR concentrations and probe for changes in the structure and dynamics of Gα that result from activation, 15N-HSQC spectra of the GDP/Mg2+ bound form of Gα obtained in the absence and presence of aluminum fluoride, a well known activator of the GDP bound state, have been acquired. Comparisons of the 15N-HSQC spectra reveals a number of changes in chemical shifts of the 1HN, 15N crosspeaks that are discussed with respect to expected changes in the protein conformation associated with Gα activation.